What do you get when you cross Harry Potter with Community, then run it through a Wayne’s World filter? Canine college deans, smelly magic orbs, and homicidal talking trees may not have sprung immediately to mind, but they all make their way into the world of Live from WZRD. The new VRV-exclusive series is a step away from the concept of magic schools as posh and charming… because seriously, not all of us are wealthy orphans with a bank full of wizard gold to pay our tuition with. East Gatewood Community Wizarding College in La Crescenta has its share of weirdness and danger, of course — what magical academy doesn’t? But the wicked witches you run into here are running public access commercials for all-you-can-eat gingerbread houses, and centaurs aren’t so much noble guardians of the forest as they are potential boyfriend material. This semester, East Gatewood has made their campus news show available via public access TV and welcomes all us non-magic types to tune in. It’s a bit of a culture shock at first, but hosts Open Mike Eagle and Dani Fernandez are on board to help bridge the gap between our worlds. YouTube viewers and podcast listeners will likely already know at least one of those names, if not both. Fernandez is a host over on the Nerdificent podcast, and recently had a cameo in Disney’s Ralph Breaks the Internet. According to Live from WZRD, she also got her wizarding school admissions letter about 15 years too late and is discovering her magical heritage all at once. Meanwhile, hip-hop artist and comedian Eagle has been at this for a while — in addition to his real-world gigs as one of the rap trio Thirsty Fish and a podcaster on the Maximum Fun Network. Like us, Dani still has a lot to learn about the magic life; but she’s not the least magically inclined of the bunch. That honor goes to their resident “tech wizard,” a magic-less student played by comedian Jessica McKenna. She still makes things work, despite not being able to see the school’s many ghosts and missing out on fun activities like making tuna cans appear. Of course, it wouldn’t be a talk show without guests! Mike’s got a hot new summoning spell that transports the nearest non-wizard celebrity to their studio. The downside is that, not being wizards, being teleported into a basement with no warning is terrifying. Fortunately, Mike’s got a spell for that, too — or, in a pinch, he can magic up some cookies. Like the show’s main cast, the guests of Live from WZRD will be familiar to fans of YouTubers, podcasters, and online influencers. Voice actor Sunwong Cho (a.k.a. ProZD) kicks things off in the first episode, with comedian Brandon Rogers and podcaster Yedoye Travis not far behind. You’ll also hear LilyPichu as a sentient tree who alternates between making bad tree puns and plotting the destruction of humanity as revenge for the mass slaughter of her tree brethren. 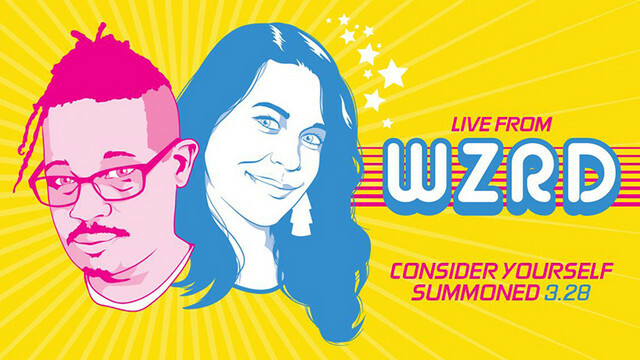 There are already four episodes of Live from WZRD ready to watch on VRV, so it won’t take long to get caught up to Mike and Dani’s misadventures on the set. Will the mystery of the magical orb ever be solved? Which celebrity will be zapped to the set next? Get caught up now on VRV!